In the early twentieth century there was a public wharf here with a ferry service from Glebe Point. 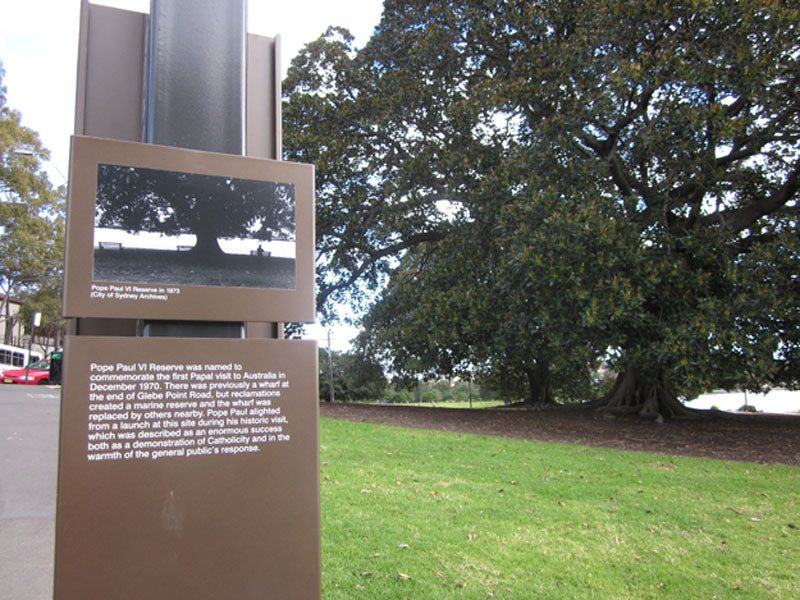 It is hard to believe that until 1988 this small reserve was the only public access to the waterfront on Rozelle Bay. In the early twentieth century there was a public wharf here with a ferry service from Glebe Point. It is hard to believe that until 1988 this small reserve was the only public access to the waterfront on Rozelle Bay. Prior to 1970 it was known as Marine Reserve, but the pious Catholics of the right-wing Labor Leichhardt Council renamed it following the first visit of a pope to Sydney. Paul VI disembarked from a VIP launch on this spot to visit the Royal Alexandra Hospital for Children, at that date still in Camperdown. The two majestic Moreton Bay figs in this Reserve are illuminated at twilight. As the sun sinks in the west, LED floods shine complementary colours on the foliage. The display is powered by a wind turbine located at the mouth of the Johnstons Canal. 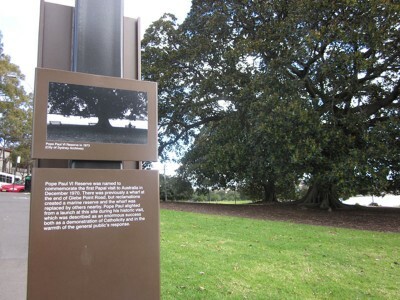 This is one of three public art works in Glebe Point Road commissioned by the City in 2008. The illumination is called ‘Earth v Sky’ and the artist is Allan Giddy.